Contributed by Ken Killmeyer, USS Forrestal Association Historian. 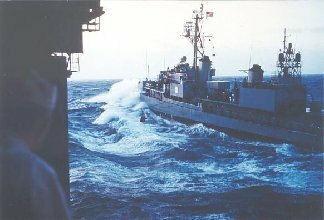 Steaming in company with USS Fiske (DD-842) and USS Dyess (DD-880) in the South Atlantic Ocean enroute from Subic Bay, Philippines to Mayport, FL, on course 311 at 17 knots. USS Fiske is in station 311, 4,000 yards from Forrestal. USS Dyess is in station 131, 4,000 yards. 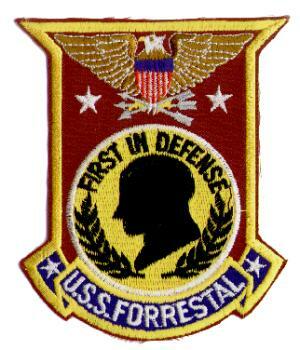 Forrestal is formation guide. SOPA and OTC is COMCARDIV TWO RADM Harvey P. Lanham embarked in Forrestal. Screen commander is Captain John K. Beling, Commanding Officer of USS Forrestal. Boilers 1B, 2B, 3A, 4B, and generators 3, 4, 5, 7, and 8 are on the line. The ship is darkened except for normal navigational lights. General condition of readiness V and material condition Yoke are set. 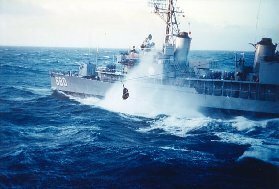 This is USS Dyess (DD-880). Forrestal returns from Yankee Station. 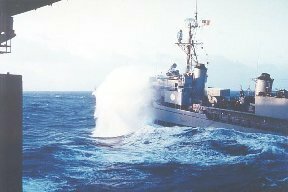 Steaming independently in the Atlantic Ocean enroute from Subic Bay, Philippines to Mayport, FL, on course 292T at 14 knots. Senior Officer Afloat is COMCARDIV TWO, RADM Harvey P. Lanham embarked in Forrestal. Officer in Tactical Command is Captain John K. Beling. Boilers 1B, 2A, 3B, 4B, generators 1, 3, 4, 6, and 8 are on the line. General Condition of Readiness V and Material Condition Yoke are set. 1050 Changed course to 280. Set the Special Sea and Anchor Detail while approaching Mayport, FL., and turning into the wind to recover helicopters. 1148 Vice Admiral Charles T. Booth Commander Naval Air Force Atlantic arrives on board. 1150 Captain Daniels chief pilot arrives on board. 1204 Due to high winds entering port delayed until 1730. 1251 Changed course to 030T. Vice Admiral Charles T. Booth Commander Naval Air Force Atlantic departs. 1826 First line over, moored starboard side to berth C-2, Mayport US Naval Station, Mayport FL., shifted the watch to the quarterdeck. LCDR J. R. Bliss, Jr., assumes the OOD watch. 1927 Set engineering condition 4. LIBERTY CALL, LIBERTY CALL. Forrestal and crew return to Mayport Naval Station 32 days after departure from Subic Bay, in the Philippines Islands. After transiting the South China Sea, Indian Ocean, South Atlantic Ocean, and Atlantic Ocean Forrestal finally arriving at Mayport, Florida, with her crew manning the rail in their white uniforms. Upon Forrestal's arrival at Mayport, Florida, many relatives and friends met the ship. Twelve members of the press representing newspapers, radio and television networks came aboard and gave national coverage to the ship. Unloading of Attack Squadrons VA-46, VA-106, and Reconnaissance Squadron RVAH-11 remaining aircraft commences. Those three squadrons personnel also depart the ship having been based in Florida. 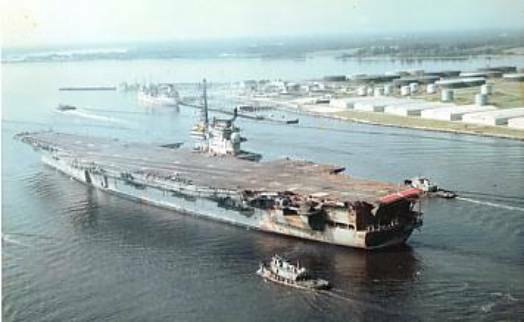 Forrestal returns to Norfolk, VA, after 101 days. Steaming independently in the Atlantic Ocean enroute from Mayport, FL, to Norfolk, VA, on course 046 at 28 knots. All eight boilers and generators 1, 3, 4, 6, and 7 are on the line. SOPA and OTC is Captain John K. Beling Commanding Officer USS Forrestal. General condition of readiness V and material condition Yoke are set throughout the ship. The ship is darkened except for normal navigational lighting. 1341 Moored starboard side pier 12, Naval Operations Base, Norfolk, VA.
1425 Shifted the watch to the Quarterdeck. With the Norfolk Naval Base band playing show tunes and Glenn Miller's World War II version of "St. Louis Blues" Forrestal maneuvered against Pier 12. Thousands of proud wives, parents, family members, and friends greet Forrestal's return. Banner and sign waving loved ones await the sight of their Forrestal sailors. The proud, glad, but sad crew members wave hello in a subdued contrast to their cheering loved ones standing on pier 12. Across pier 12 USS Randolph's crew honors their Forrestal shipmates by manning the rail. Pier 12 with USS Randolph (CVS-15) beyond. A scheduled Change of Command Ceremony was conducted with Captain Robert B. Baldwin, USN assuming command of Forrestal relieving Captain John K. Beling. Among those in attendance for the Change of Command Ceremony were Vice Admiral C. T. Booth, II Commander Naval Air Force, U.S. Atlantic Fleet and Vice Admiral F. L. Ashworth, Deputy Commander in Chief, U. S. Atlantic Fleet. Captain John K. Beling, now an Admiral-selectee, has received orders for duty in Washington, DC, to be the Director of Development Programs in Naval Operations. 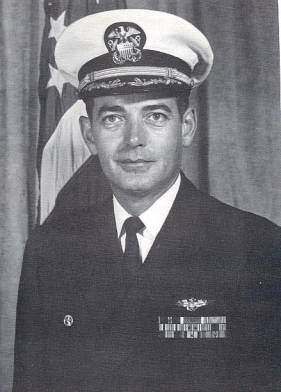 Thirteenth Commanding Officer of USS Forrestal (CVA-59). Forrestal got underway from Pier 12, U. S. Naval Operating Base, Norfolk, VA, to transit the Elizabeth River enroute to Norfolk Naval Shipyard, Portsmouth, VA, and moored to berths 2 and 7. 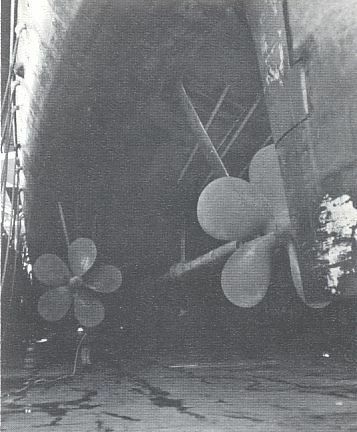 Early in the afternoon Forrestal entered drydock number eight. Work begins to repair damage that occurred from the 29 July 1967 fire. Large sections of the damaged flight deck will be removed. Some 200 compartments will be totally replaced from the 03 level, 02, 01, hangar deck, second deck, and even some on the third deck and below. 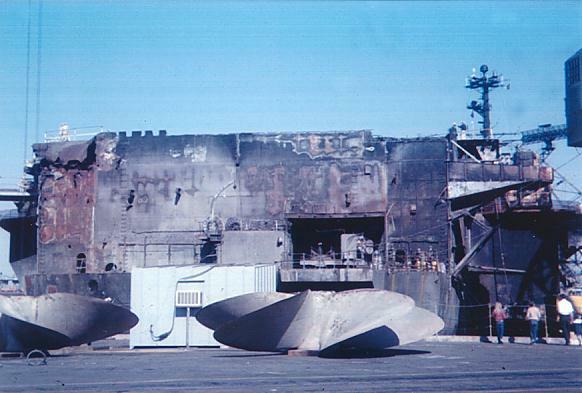 The ship's port rudder received several holes from bomb detonations. All four of the ship's five-inch gun mounts and related equipment will be removed and not replaced. A missile launcher will be installed on the starboard side forward of the quarterdeck. More than 600 shipyard workers have been assigned to complete the repairs. 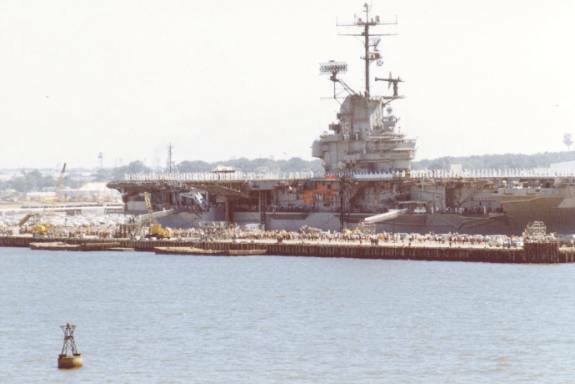 Other notable areas that will be repaired are the: post office, jet engine shop, parachute loft, fantail, carpenter shop, boat and aircraft crane, and port and starboard quarters. View is aft port side.